How long were rust belt cities going to be able to, as author Robert Putnam would phrase it, “bowl alone?" It turns out not very long. 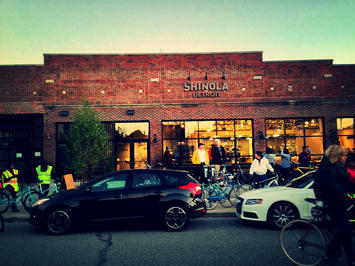 Now, for every Detroit horror story, there’s a shiny Shinola. Buffalo is a nascent hipster haven. With its well-defined physical landscapes and deep cultural histories, the Rust Belt aesthetic has long been subject to the same forces that have turned places like Williamsburg, Brooklyn and Chicago’s Wicker Park into moneyed enclaves of those seeking a repurposed past for modern means. As the global city shatters into a million pieces, Rust Belt cities are poised to piggyback on their own organic growth, becoming ever more attractive with their lower barriers to achieve a sense of urban authenticity. Yet, as pockets of Rust Belt cities are successfully redeveloped, is there reason for concern that they may be losing some of what sets them apart? In Chicago, where the Rust Belt exists under the glittering shadow of its Global City sheen, the steady march of hipsterdom through Wicker Park and Logan Square is nearly complete. On the Far South Side of the city, on the fallow 700-acre grounds of the former US Steel South Works mill, a massive, master-planned mixed-use development is envisioned and (very) slowly taking shape. In Pittsburgh, a city always a little ahead into the future, Lawrenceville has been dubbed one of the “top 26 most hipster neighborhoods in the world” by Business Insider magazine, while in the South Side neighborhood, the old J&L Steel mill on the banks of the Monongahela River is currently home to SouthSide Works, a “shop/dine/play/live” mixed-use lifestyle center of offices, residences, movie theaters and outlets of H&M, American Eagle and The Cheesecake Factory. These movements through the cityscape may seem disconnected, but they represent a waning of the cultural affect that is specific to a sense of place and defines it. Whether it is a sort of hipster-variation-on-a-theme or a top-down, master planned repurposing of formerly industrial sites, there is an emerging urban typology that is seen and felt in cities everywhere. In this way, these commoditized developments echo their suburban forbearers in standardizing a formula for successful sameness. When the French anthropologist Marc Auge coined the term 'non–place' to describe the interstitial spaces in which so much of modern life unfolds, he focused in on the transitory nodes of transit and commerce such as airports, highways, and supermarkets to describe a condition wherein the individual “becomes no more than what he does or experiences in the role of passenger, customer, or driver”— namely, a consumer. Many critical urban theorists have adopted Auge’s theory to describe the monotony, placelessness, and anywhere-ness of sprawling suburbs. One could argue, though, that as cities proper increasingly mirror one another in their (re)development, Auge’s theory now threatens to apply itself to the fabric of cities themselves. It begs the question of whether there are perhaps other ways to engage and activate 'non-place' into meaningful, active space. Managing needed investment while maintaining distinctiveness — which is, of course, what makes any city worth its while to begin with — is a delicate dance. Like everywhere else, the Rust Belt is inspiration for a form of American magic realism, wrestles with this. Cities change. To assume the city hasn’t always been a speculative spectacle is ludicrous, as silly as it is to perpetuate dead geographies onto the living. But the refashioning of Rust Belt cities’ physical and cultural landscapes should at least give us pause to wonder if we’re losing realism and magic in manufacturing a sense of place.